The Saudi couple in Colorado kept their Indonesian “slave” for three years where she slept on a mattress on the basement floor and was paid less than $2 a day. Al-Turki is also accused of repeatedly sexually assaulting the woman. A Saudi Arabian woman indicted with her husband for keeping a young Indonesian woman in their home as a virtual slave pleaded guilty to reduced charges today in federal court. Sarah Khonaizan, 35, pleaded guilty to a charge of harboring an alien in the U.S. for private financial gain. Her sentence could range from probation to up to a year in prison, depending on how federal sentencing guidelines fall in the case. Her sentencing is set for July 28. Prosecutors have agreed to seek a sentence of probation with home detention. Khonaizan and her husband, Homaidan Al-Turki are charged in U.S. District Court and in Arapahoe County District Court with keeping the woman in their home for four years, forcing her to perform long hours of housework and child care for very little Pay. Al-Turki is also accused of repeatedly sexually assaulting her. Khonaizan is expected to plead guilty in the state case on Friday. Defense attorney Forrest Lewis said Khonaizan pleaded guilty to put the case behind her. Facing deportation as an illegal alien convicted as a felon, she has agreed to return to Saudi Arabia once her obligations to the courts are completed. This is not the first time that a Saudi family living in the US was convicted of slavery or of viciously abusing servants. In March of last year a Saudi Arabian Princess living in Winchester, Massachusetts was arrested on federal charges of enslaving two Indonesian women to care for her wheelchair-bound prince and unruly sons who allegedly spit on them. Neighbors called 911 Friday after Ismiyati, 36, ran crying from the apartment she shared with the princess. She told deputies al-Saud beat her, hit her head against a wall and pushed her down a flight of stairs, leaving her unable to walk. “When we talked to her (Ismiyati) through an Indonesian interpreter and saw the extent of her injuries, we upgraded the charges to a felony,” Stewart said. On a 911 tape released by the sheriff’s office, Ismiyati can be heard crying hysterically in the background while a neighbor talks to a dispatcher. “Help me. Help me. 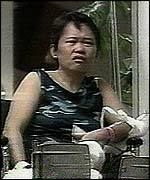 The boss pushed me down the stairs,” Ismiyati told the dispatcher through an Indonesian translator on the telephone. In addition to cooking, cleaning and laundering clothes, Ismiyati Memet Suryono said she stayed by Princess Buniah al-Saud 24 hours a day. She stood at the shower to open and close the curtain when the princess bathed, she said, and was not allowed to close her bedroom door at night in case the princess needed her. When Buniah, 41, arrived there last March to study at the University of Central Florida, she brought Soryono, 36, as her personal servant. 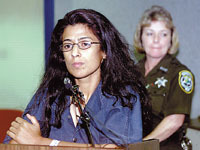 In Saudi Arabia she had never hit her but, claimed Soryono, this changed in Florida. She says she was slapped for minor misdemeanours – such as walking in front of the princess while they were shopping. Ismiyati was treated and released after her run-in with the Princess. She pummeled her driver, a man named Hamada whom she suspected of taking $200,000. When al-Sudairi found out about the missing money, she threw a vase or potted plant at Hamada and then screamed and hit him, investigators said. Deputies working off-duty at the time watched as the princess removed a sandal and beat Hamada, then punched him. The deputies did not report the battery. Maha al-Sudairi was later appointed consulate at the Arab-French Chamber of Commerce!